We have had a very long working relationship with our website provider, The Internet Marketing Company. They were one of the first companies we did Direct Debit collections for all the way back in 2002. They have provided us with a fabulous, consistent service and look after all our website needs including our SEO. So when they write out to their client base and send something as lovely as this, we thought we would share it. With over 20 years experience, and a client base of more than 1,600 customers, Eazipay are one of the most significant Direct Debit collection companies in the UK today. A dedicated and professional team, they have boundless drive and enthusiasm. Eazipay have worked with the Internet Marketing Company for many years and so we were delighted to win the pitch when the time came for a radical overhaul and redesign of their website, at the end of 2015. The highly successful partnering of Prussian Blue and tIMC provides both parties with, what is effectively, an in-house resource. tIMC's intimate knowledge of Eazipay coupled with PB's fresh eye enabled us to very easily get in step with Eazipay's vision and objectives. The site went live in February 2016 and is constantly updated. Eazipay keep us on our toes. They are exacting clients, but only because they are constantly striving to be the best in the industry and to provide exceptional service to their clients. Luisa Grey, the very hands-on Director at Eazipay, tells the story from their perspective and we're really not sure there is anything we can add - except to say that we enjoy the working relationship very much and couldn't be happier with this testimonial. "In order for us to maintain our leading position as the pre-eminent provider of Direct Debit and automated payment services for our clients (which are predominately SMEs), it is imperative that we partner with organisations that understand and support our objective of 'leading from the front'. To that end, and after a comprehensive examination of the market, we took the decision to work with the Internet Marketing Company + Prussian Blue. They quickly developed a clear grasp of what we want to achieve with our website and the absolutely critical role our site plays in the development of our business. The Internet Marketing Company + Prussian Blue may not be the largest company we met, but what they lack in size, they more than make up for in expertise. And that's what we want to pay for: expertise. We don't want to be paying for expensive offices in expensive parts of town. Nor do we want to be charged director rates for tasks that are performed by less experienced members of staff. Our website is central to the efficient running of our business and we would not be comfortable with anything less than knowledgeable, experienced professionals working along-side us. The Internet Marketing Company + Prussian Blue gives us that reassurance. The Internet Marketing Company + Prussian Blue quickly established itself as part of our team and gained the trust and confidence of the Eazipay team. They listen to us, understand our issues and objectives, create solutions and implement them. Occasionally, they challenge us. They have stayed alongside us for the last two years and although our initial objectives have been met and our site is operating at optimum efficiency, we are happy to continue partnering with the Internet Marketing Company + Prussian Blue." 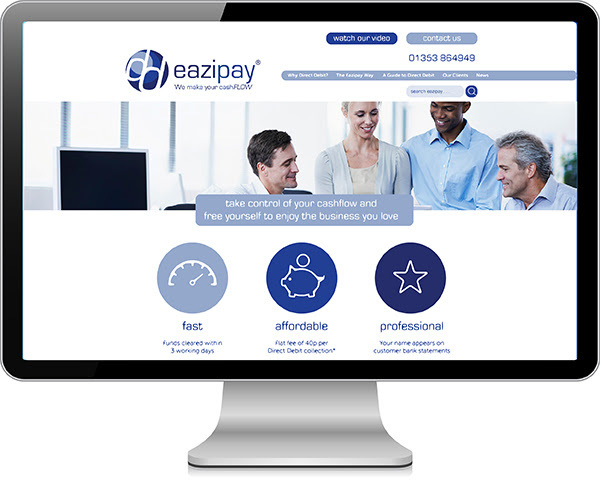 Visit this site at www.eazipay.co.uk and contact them on 01353 864949 if you'd like their advice on how to better manage your customer payments.